The Brackagh Quarry Wind Farm Community Fund opened for applications on 1st April 2019. The Fund which is managed by RES and administered by Workspace, offers grants of up to £2,000 to community and voluntary groups from within a four mile radius of the wind farm site. The Fund encourages applications from community projects which are for the benefit of residents of this area and can provide both capital and revenue grants. How the work will be continued after the project has been completed i.e. its sustainability and legacy. 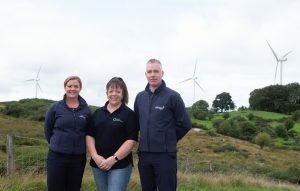 RES, who asset manage the three turbine Brackagh Quarry Wind Farm, located in close proximity to Draperstown, has committed £25,000 per annum to the Draperstown area as part of its community benefit programme which offers financial support to the communities in which its wind farms are located. £10,000 per annum will be distributed as grants through the Brackagh Quarry Wind Farm Community Fund with the remaining £15,000 per annum committed to assist in bringing the former Rural College/Derrynoid Centre site back into use for the benefit of the local Draperstown community.